One of the huge benefits of homeschooling is that, when one is sick, one can actually have the luxury of being sick. I wholeheartedly believe in the medicinal power of rest. Although I am a pretty solid Type B, I have to talk myself into resting, really. This week I have read three novels already. I'm a fairly fast reader, but my reading time is usually restricted to 20-30 minutes (or until I fall asleep) in bed each night. All three books were astonishingly excellent. I have a review of The Autobiography of Mrs. Tom Thumb up on my SmallWorld Reads blog already, and if my head continues to clear, I'll have the other two—The Story of Beautiful Girl and Expecting Adam— up soon. I figured I would get sick this week, since both Randy and Laurel had this nasty cold last week. Unfortunately for them, last week was one of those insanely busy weeks. Poor Randy took the kids to Winter Jam Friday night, at the height of his cold. If you aren't familiar with Winter Jam, picture this: 20,000 teenagers in an arena, listening to a dozen bands for 5 hours, plus finding parking and then getting out of a jam-packed parking garage after the concert. All with your head about to explode. It's nightmarish. And if that wasn't horrid enough, he had to be out of the house at 6:30 a.m. the next day to spend his entire Saturday at Boy Scout Merit Badge College. I'm pretty sure he deserves some kind of major award. I did make him apple pie. I have a new box of herbal tea, thanks to my sweet husband, and two more novels to read at my leisure. 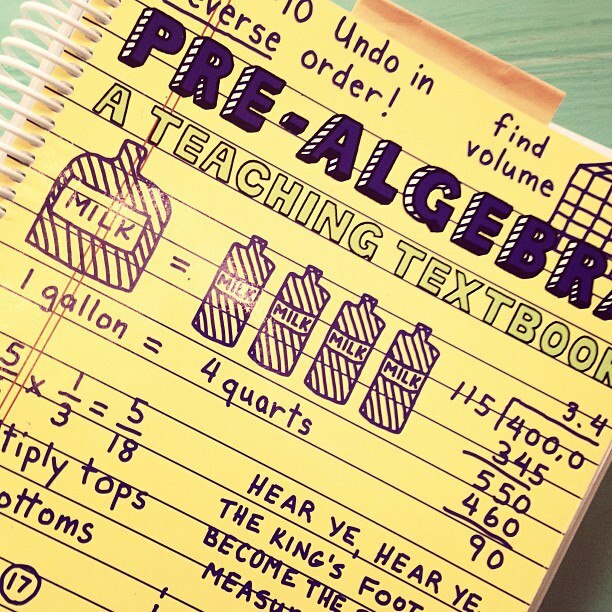 We'll do a light day of school—a math lesson, some grammar, a little bit of Ken Burns' The War, and just reading. I have nowhere I must go today, nothing I absolutely must do. For the rest of this week, I have a small stack of essays to read and a bit of lesson planning to do, 423 shirts to iron, and a couple of articles to write. Again, it's times like this that I am struck with the simplicity of my life, the gift of choice, the shared vision that Randy and I have for this life of ours—a life that—most of the time—is simple enough for sick days. 1. Wake up next to the love of your life. Kiss him gently and leave him snoring. 2. Watch the sunrise with a cup of coffee, a fire in the fireplace, and a happy dog at your feet. 3. Pray with abundant gratitude, thinking about what an amazing year this past one has been—a year relatively free from stress and pressure, a year filled with good things and fabulous people. 4. Be called the most beautiful, sweetest woman in the world by your husband when he wakes up and wishes you a happy birthday. Look in his face and knows he means it completely. 5. Eat eggs and bacon, which your husband cooks for you, while drinking another cup of coffee. 6. Receive sweet hugs and birthday greetings from two out of your three beautiful children. 7. Go to your church, your still new church, the one that you are excited and joyful to go to, the one that doesn't sing "happy birthday, dear Christian" to you in the middle of service, for which you are immensely, almost tearfully grateful. Get hugs from friends. And a pretty scarf that your friend crocheted just for you. 8. Come back home and eat leftover chili, because that's what you want to do. 9. Read dozens and dozens of birthday greetings from friends on Facebook and feel tremendously grateful—and loved. 10. Eat leftover Valentines Day chocolate, guilt-free because it's your birthday. 11. Read a book until you're so sleepy that you just have to take a nap. Take that nap. 12. Take apple pie to your parents, who have colds and can't come to your birthday dinner. Hug your mother, while she says, "What a wonderful day that was. I still can't believe I finally got my little girl, my little paper doll. My Dad loved you so much." 13. Receive birthday wishes from that third child, the one away at college, whose father texted him and said, "Call your mother!" He would have remembered eventually. 14. Eat a spectacular dinner made by your husband of all your favorite things: sushi, steak, roasted Brussels sprouts, baked potatoes. 15. Open presents from your sweet family that knows you sooooo well. 16. Play a board game and laugh. 18. Watch the season finale of Downton Abby. Whatever. 19. Read more birthday greetings on Facebook, text messages, and emails. Be happy, again, for the people in your life who took a minute or two to wish you well. 20. Go to bed, back where you began the day, next to the love of your life. • Duncan did a report on Hitler for his Dialogue with Veterans class. He had actually written a biography of Hitler several months ago as part of our WWII study, so we just cut this report down to one page. That was tough! I was so relieved that he gave his speech. He's developed some anxiety about public speaking this year, so we are working on conquering that. 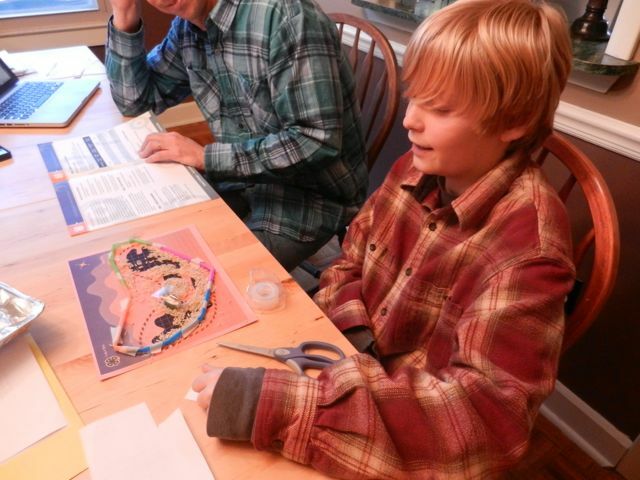 • Duncan has been working hard on finishing up a few merit badges for Boy Scouts. He finished Robotics just last week and also had his Board of Review and moved up to First Class. This weekend he goes to an all-day merit badge "college," where he'll do the Reptiles and Amphibians badge. He's been reading the book like crazy in preparation. Finishing up the robotics merit badge. Not exactly sure what's going on here, but they know! • Laurel and her fellow AHG Pioneers and Patriots (7th-12th graders) worked hard planning and setting up for the annual Father/Daughter dance and then got to enjoy it. 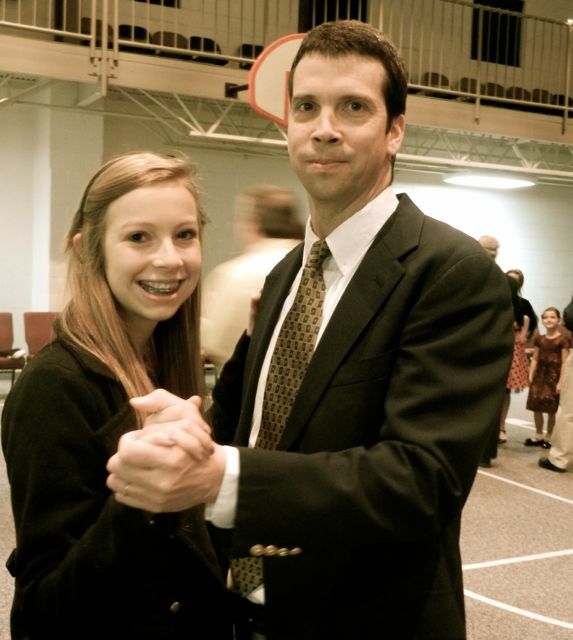 Randy and Laurel at the Father/Daughter dance--probably her last! 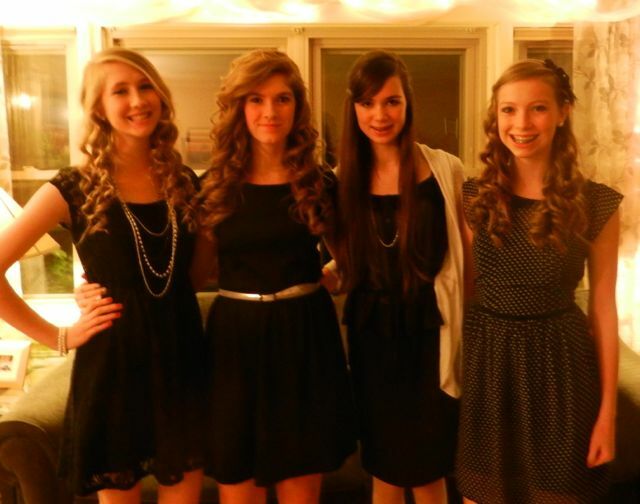 • Our teen group had their annual Black and White dance, so she's had her fill of dances for a while. 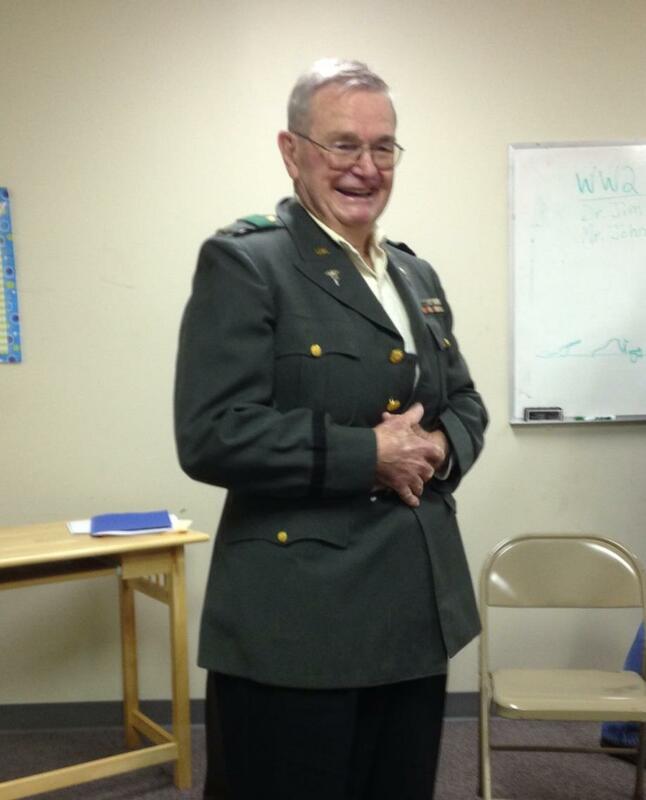 • My Dad spoke to Duncan's Dialogue with Veterans class. You can read all about that here. • Duncan and I have been thoroughly enjoying studying WWII. Last week we read Dear Mrs. Roosevelt: Letters from Children During the Great Depression and Winston Churchill: Soldier, Statesman, Artist. We've started When Hitler Stole Pink Rabbit, which is fantastic so far. 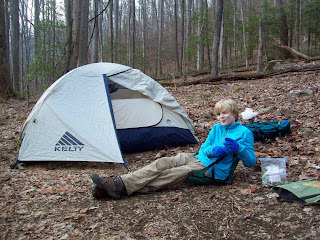 I can hardly wait for Duncan to finish all his Boy Scout stuff this weekend so we can get back to it! 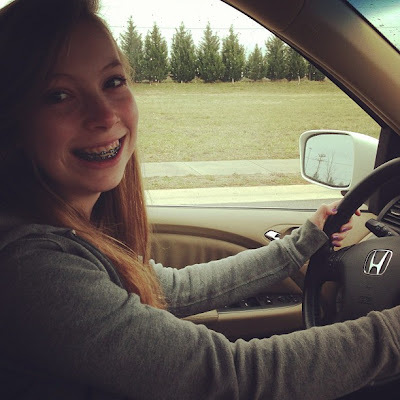 • Laurel got her driver's permit a couple of weeks ago, so we have started driving lessons! We have a perfect spot across the street—the undeveloped part of a subdivision. There are only three houses but lots of cul de sacs and stop signs. She's doing great so far! She'll be 16 in six months, and I imagine she'll be totally ready for her license by then. • Randy and Duncan went for a backpacking trip last weekend. Randy's working Duncan up to long hikes with a heavy pack. I think they went 3 miles one day and almost 4 the other, and Duncan's pack was around 25 lbs. • Laurel's classes are all going well. We finished reading The Crucible in American Lit and are now beginning A Raisin in the Sun. I haven't taught this one before, but the Clarence Brown Theatre at UT is performing it in a few weeks. I love to be able to tailor my literature choices based as much as possible on local theatres' seasons. • And finally, I am happy to report that Duncan has finished pre-algebra and moved onto algebra 1! We skipped the first 25 lessons and are still doing review, but hopefully soon he'll start getting into new material. And that's what has been going on in our own small world!